I happened to notice several items in going around planets that I would have liked as stronghold decorations, so I decided to note them down for suggestion. As I went, I noticed items that would be good in other people’s strongholds based on the theme they used for decorating, so I noted those down too. This is not just a list for my personal strongholds but general list of items that would like to see available as decorations. As a note, not all strongholds are decorated as personal residences. Some are intended to be personal ships, some business, hospitals, shipping docks, repair bays, etc. With that in mind, the decorations listed below try to accommodate a wide variety of creative themes. Since this is a long post, I've decided to make use of the spoiler tags to keep it from getting too cluttered and used headers to make sections easier to find. Using pre-existing art allows people to recreate their own spaces along the lines of places they have already visited. In a way, it allows for an extension on existing content that can be customized by the player to suit individual needs. This way the player gets a space they want, a new area to function in, and some of the developers might be able to focus more on new things or at least different things for other content. Also, since this is art that is already arranged and in the game, it should be possible to rip it from existing assets somewhere and may not require much in the way of tweaking. Some of the best decorations have animations and I think that more of these would not only be good for decorations, at least for appearance, but would also make for good cartel market items. Passive ongoing animations such as fire, water, or spinning on some decorations add aesthetic appeal and active animations such as clicking to get the turrets to fire or getting the holo-tables to display their holos adds interactivity that allow players to customize their strongholds into interactive venues for themselves and other players. However, a few changes would make them better. It would be great if interactive decorations were only highlighted in blue during mouseover. They do need to be highlighted to point out that they are interactive but not all the time. For instance, the Antipersonnel Defense Turret is a great decoration, but it would be nice if it didn’t glow blue when not in use. Also, it would be nice for consoles to have an animated version that would trigger button pushing or analyzing animation in characters when used. Perhaps the non-animated version could come from drops or prefabs and the animated version could come from cartel packs. Another future option would be enable stronghold mini games on certain items or simply release enough kinds of interactive decorations that players can invent their own minigames simply by placing decorations and inventing rules for a game. These are mostly requests for preexisting art found on planet maps, but there are requests for not currently available decorations (mostly) in the misc. section. There are possibly a few duplicates of items that already exist as decorations. It’s difficult to tell what is already a decoration when the preview window is bugged. Also, there may be a request for the same art on a different planet. This list was compiled over the span of many weeks and some things may have caught my attention more than once in that time. But the attempt was made to not duplicate requests. I attempted to come up with descriptive names that would help distinguish the item(s) I was after from others in the area of the coordinates. I tried to match naming schemes of existing decorations where possible. The coordinates were taken where my character was standing not where the object is; however, there are no coordinates for Tython and Ord Mantell as I didn’t start recording the coordinates until after searching those planets. In the case of objects with other objects on them, if I only wanted a singular object I attempted to note that below otherwise the suggested decoration includes the attached objects as well, such as lights on tables. In the case of some items, the intent is to get a scaled down version that will fit in strongholds. 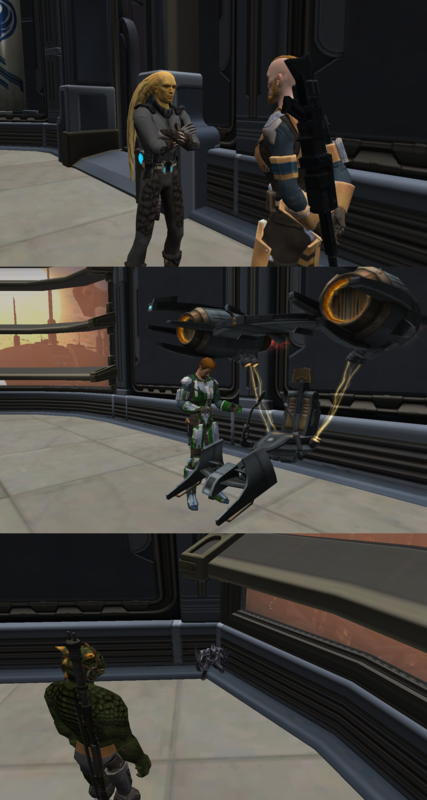 Nar Shaddaa Wall Holo ads. A stronghold that is just an outdoors landscape, no structure, that can be turned into a garden, a minefield, a small village or some other outdoors area. A Starfield Wall Decoration for strongholds set up to be ships. Large Wall Hook. Large holo displays of the various planets. That is an impressive list. I have some general suggestions below. A priority travel terminal. This is the terminal that lets you go to the daily areas, as seen on the fleet and the daily areas. A wider variety of lights that provide ambient light that do not come from the cartel market and are easily accessible to players. More items that make ambient sound. More personnel. I would like to see personnel in different poses such as sitting, or let us change the poses of personnel. I have all of these chairs and no one is sitting in them. It would be great if some could also walk pre-determined paths. An alternative to display armor than the current system of using companions. One issue with companions is that there is certain armor that they cannot wear. For example, any piece of armor with a class restriction. We need Jacuzzi's and swimming pool's!! Oooh... the ambient sounds idea would be nice. Sitting works pretty good right now if you space items out right. You realize we can sit with the /sit command, right? It will actually cause you to sit on an invisible chair, so you can just position yourself near a chair and use that command. There is one for sleeping on a bed too, but I don't recall if it is /sleep or not. They came out with those emotes for everyone even F2P when strongholds launched. I just had a great idea. Chairs that let you right click to sit and show you a menu of sitting styles so you can choose how you sit in the chair and the emote appears the same to everyone. So people who want their hands behind their head can chose it and people that want the thinker can chose it, but everyone see the same emote. This is so needed. /sit causes you to sit on the floor or whatever surface you're currently on. /chair will give you the invisible chair, letting you sit at chair height (assuming you were standing on the floor originally). Ah, that's what I had in mind, sorry for the confusion and I appreciate the correction! While I am thinking about it, it would also be nice if you could buy more than one of a given stronghold. For instance, you could buy one Coruscant stronghold to be a personal residence and another to serve as your character's business since they function on Coruscant mostly. I wouldn't mind the ability to place alternate characters like alts. Obviously, the decoration becomes entirely invisible when the alt, himself, shows up. But when offline, the alt appears back in the stronghold. Also, the ability to pick the status companions take, such as holocall, present, or absent; despite which origin character they hail from. And finally, the ability to assign animations to both alts and companions. So whether I want a pair of companions angrily arguing with eachother, my bounty hunter alt reclining on the sofa after a hard day's work, my sage alt meditating in front of a datacron, a tech-loving companion tinkering with a speeder, or Qyzen cornering a Subteroth that apparently snuck in, it would feel more homely if we can pick and choose who's there and doing what. It kinda works for Theran, but it would be so much nicer to have a dropdown list with all/most the emotes and idle animations this game has to offer.